Using High Beams at NightDeer have reflective tissues in their eyes that improves their vision at night. 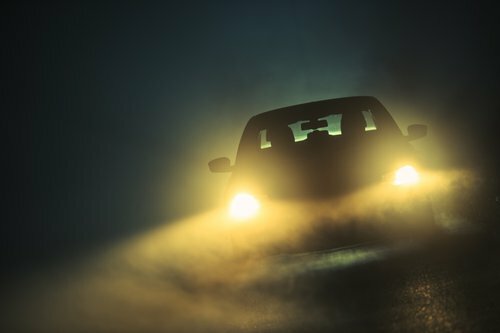 Keeping your high beams on as often as possible can help you spot deer and the greenish gleam of their eyes from a greater distance after dark. Watching for the HerdDeer usually stick together in groups. If you see one deer cross the road ahead, continue to go slow, because a second or third deer is likely close behind. During mating season (November to January), deer are even more likely to be on the move in groups, so be especially cautious. Not SwervingIf you're driving a car and a deer suddenly darts in front of your vehicle, resist the urge to swerve. Even head-on collisions with deer are far less dangerous than head-on collisions with other vehicles or trees. Swerving can send a car spinning in wet or icy conditions. Keep a firm grip on the wheel and try to slow down, but if hitting the animal seems unavoidable, don't jerk the wheel and just let it happen. Being Extra Cautious on MotorcyclesWhile hitting a deer is rarely fatal in a car, motorcycle accidents caused by deer are often catastrophic. Collisions with deer likely contributed to the 35,092 motorcycle accidents fatalities reported by the National Highway Traffic Safety Administration in 2015. Bikers should research areas with deer overpopulation before hitting the road, and should avoid driving at dawn and dusk, when deer are most active and most difficult to see. Two things can happen when a deer is involved in a crash-- a car can directly hit the animal, or the animal can cause a driver to swerve and crash into another vehicle or private property. In either case, call the police to report the accident, and be prepared to start searching for car accident lawyers if other drivers were also involved. By knowing good driver's safety, you can lower your chances of an unfortunate encounter with a deer (or several) on the road.